Without Text-to-Speech, Kindle Paperwhite is about as useful to me as a paperWEIGHT! I was quite excited to learn about the new line of Kindles that would offer a front lit e-ink display. 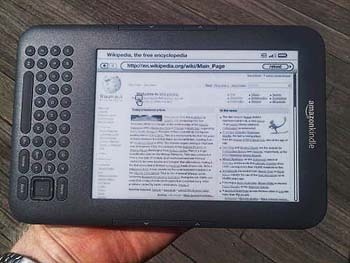 While I am still partial to my Kindle Keyboard and prefer it to the touch screen, I would have been willing to do away with it for a chance to have a self-illuminating e-reader. I was on my way to click “pre-order” until I decided to check out the specs, only to learn that the new e-reader will not offer audio—meaning it will not offer text-to-speech (TTS). TTS has been an invaluable feature for me, allowing me to progress through a book more quickly for moments when I can’t read or don’t feel like reading and fatiguing my eyes. And it progresses faster than audiobooks. So, needless to say, I was utterly disappointed with this decision by Amazon. It is the ultimate deal breaker. Amazon’s supposed reasoning (don’t quote me on this) was that it wasn’t a popular feature among most of its customers. I don’t know if I buy that because this feature will be available on its Fire devices. Not to mention, it’s missing audio capabilities altogether which will affect audiobook and MP3 users. I suspect that Amazon is trying to limit audio on future e-ink devices in order to migrate this cluster of consumers over to their LCD models. My philosophy: if it ain’t broke, why fix it? I own a Kindle Keyboard, Android Tablet (that I purchased from Amazon), and an Android Smart phone. I have 3 options for e-book reading (aside from my computer), yet I far and away prefer the Kindle Keyboard. The e-ink display and TTS are an unbeatable combo in my mind. My kindle was stolen a few months ago and I tried to make do with using my tablet as an e-reader. It was so horrible that I went ahead and bought a new Kindle. I am just that dedicated. But after learning that the Paperwhite would lack text-to-speech, this prompted me to look for alternatives. To fellow tablet/smartphone owners, there are affordable e-reader apps out there that offer TTS. I even downloaded the INOVA text-to-speech app for free; it integrates with a number e-reader apps. “Kendra”, the voice, provides fantastic quality and there are more adjustable speeds, pitches, and accents. It’s better than the Kindle’s “Samantha”, but as I said earlier the e-ink/TTS combo is unbeatable and I am satisfied enough with Samantha’s quality. But just in case Amazon does away with the e-ink/TTS combo for good, it’s nice to know there are alternatives. Alternatives that are only going to get better with time. All is not lost for those of us who understand how important this utility is to our reading habits, even if Amazon doesn’t seem to care anymore. Additional options include Moon+ Reader Pro. It’s very affordable at $5, but there is also a free reader I tried called FBS Reader. It offers a text to speech plug-in (you have to download it separately) and it works pretty well. One criticism is that it breaks up the sentences which stalls progress a little bit, but as I said, with time I’m sure these alternatives will only improve and become more readily available. Bottom line, if Amazon brings TTS back to future e-ink models they will retain me as a customer, but if they limit TTS to the Kindle Fire then they’ll have nothing to offer me since I already own a tablet. Yes, the Keyboard is still available for now, but it’s positioned to be phased out since they don’t even want to update the firmware for it. For me, TTS is more important than e-ink. So if my kindle goes out and they still only offer e-ink without TTS I will adjust with my tablet and phone, even though I’d rather not have to do so. TTS/e-ink is the best, but TTS/LCD certainly trumps frontlit e-ink/nothin’. Six months ago had you told me I would be a Kindle owner, I’d have laughed. I was a strong advocate for real books. How could a tiny screen compare to the feel of turning a page? How could it compare to the smell of a newly printed novel? How about that whole “page number” thing? Could an e-reader really compete with a reading experience that’s been ingrained in us since childhood? The answer is yes. I surprised myself just now as I tried to remember all of the benefits of paper books. I’d been preaching them just before Christmas. Are there still benefits to paper copies? Absolutely, and I will get to that later, but for now I have to share why it’s becoming increasingly hard to go back. 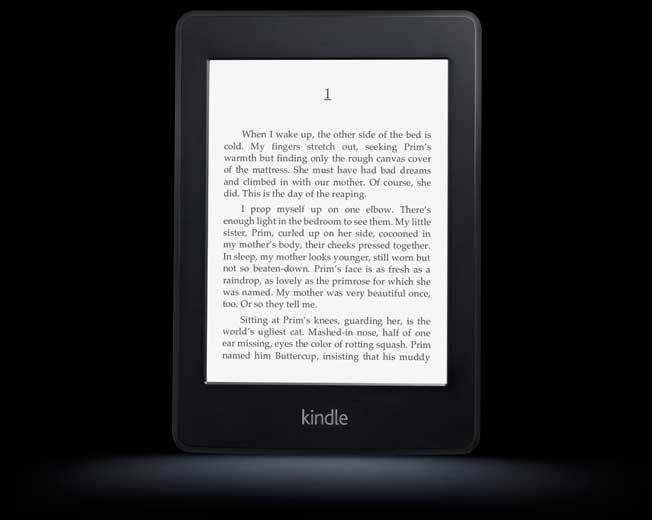 What makes the Kindle experience so amazing? E-ink is a start. I found it very easy to immerse myself into a story because the screen looks so close to an actual book page. I can read it in the sun with no glare like an LCD screen, which has come in handy a time or two. It can go beyond that with the font size, style, and spacing being easily customizable. You can also rotate the direction of the text to read from your Kindle sideways. I find this feature the most useful while I’m riding a machine bike and reading it from a distance. Text-to-speech (TTS) is hands down why I own a Kindle instead of another e-reader. I originally planned to buy a Nook, but Best Buy only had the $199 Nook in stock and just received a shipment of $139 Kindles. The choice was easy and I never looked back. While many hate text-to-speech, I personally L-O-V-E it!! It’s why I’ve read 22 books so quickly. Many hate the robotic voice, but I don’t use it with expectations of it being an audiobook. The speech has 3 different speeds. The fastest speed is about as fast as I can skim a page, so with TTS in use I can skim along while retaining what’s on the page. It also keeps me focused so that my mind doesn’t wander. I know we all have that issue when a book reaches a slow patch (or if it’s just one big 400-paged slow patch. Twilight, I’m looking at you). It can take some getting used to, but I actually find the female voice a little better than the male voice. While robotic, it does attempt intonation changes, like with question marks. It also pauses with most punctuation. The only complaint I’d have is that it doesn’t pause with dashes. It will occasionally mispronounce words, but again, you’re looking at the text yourself, so you know what is there. I love love LOVE its Dictionary feature. All you have to do is place the cursor over the word and the definition pops up. It makes the reading process tons faster than putting the book down and looking up the word elsewhere. Bookmarks, Notes, and Highlights are easy to create. I don’t write notes as much as I add bookmarks and highlights, but using the notes feature would be great for reviewing purposes. I add bookmarks and highlights far more often now than I would have in paper books. The Kindle displays several bookmarks and highlights at a time. You also have the option to view popular highlights from other kindle users; it’s really cool for when you want to find the most memorable quotes. Word Search saves me a lot of time that I’d otherwise be spending thumbing through a book. If there’s a certain character or plot point I’m looking for, I can usually recall a specific word or phrase related to what I want. If it’s in other locations of the book, that’s even better because I can refresh myself on all of the facts. Page Numbers have recently been added that allow you to follow along with readers who have paper copies of the book. I also like it because it makes me feel like I’m making progress. Most of the time, only 1% of progress translates into several kindle pages, and sometimes that makes me feel as if the book is too long. Page numbers have helped a lot with that as the numbers steadily increase with every turn or two…like a real book! Battery Life is bliss! I use TTS quite often, but I find that I can get through an entire 350-400 page novel, and then a significant amount of a new title with TTS in use. That translates into perhaps 7-10 hours. However, if I didn’t use that feature I would have to recharge at least once per month. Definitely beats the Nook at every 10 days and the Nook Color at about every 7-8 hours. My co-worker often complains about her Nook Color shutting off while she’s on the train reading a really intense scene. She does this, mind you, as she’s asking to borrow my USB cord in order to recharge hers. I couldn’t imagine traveling and then having my book cut off on me! Thankfully, I shouldn’t have that problem. I commute about 2 hours everyday for work, and about half of that time is spent riding the subway. Based on my general observation, I would say that the graphite Kindle 3s sell better than the white ones. So far I’ve seen no one with a white one. There are times when I am commuting and if I see a fellow Kindle owner, we’ll give each other a nod in acknowledgment. It almost feels like being in a club. I notice that’s more of a trend with Kindle owners than other e-reader owners. Even still, I sort of feel bad for those with paper books. They don’t know what they’re missing, especially when it comes to reading on the train. Often times people are left standing for 30 minutes or more, and it’s great to have one hand free to hold onto the railing while you can hold your e-reader and turn pages in the other . Yes, I’m having a bit of a love affair with my Kindle, but it’s not blind love. No e-reader is perfect. Book Prices. Oi, don’t get me started there. There have been times when an e-book costs more than a paper copy. It’s definitely a hot debate right now as you can imagine that it grinds the gears of so many people. The idea of purchasing an e-book is to save money, not spend more while essentially getting less since the production costs of e-books are much less than paper copies. They do offer a number of free and cheap books, but the good stuff will cost ya. Trying to read Reference Texts and anything with numerous color photos would be a nightmare on this machine. 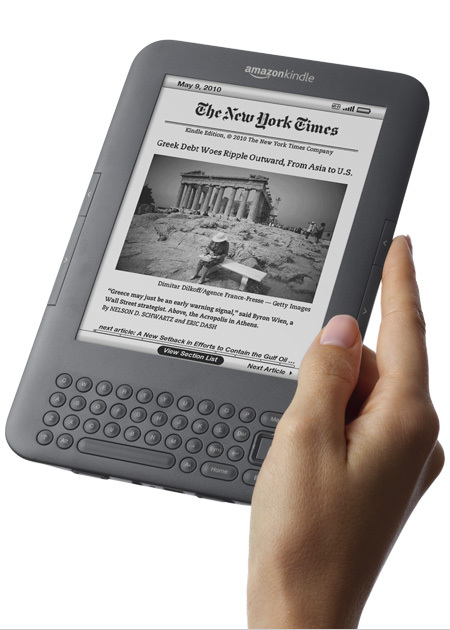 The Kindle is most useful for linear books, namely fiction and non-fiction titles. I couldn’t imagine using it to read textbooks for school, or video editing and effects books, or design books, or Photoshop books with tutorials and examples. I tend to flip back and forth with those a lot. My rule of thumb: anything that requires studying should not be purchased on the Kindle. You will have a miserable experience. The User Interface is somewhat archaic as a set of lists. You can organize books within the lists; you can make it by genre or author or whatever you’d like. I do imagine that this will get pretty cluttered if you fill the Kindle to capacity, no matter how many subcategories you have. The subcategories will also get lengthy. It would probably take longer to find your titles compared to seeing the covers easily displayed. The Internet also isn’t the greatest. Sure, you can order books just fine, but that’s where it ends. Trying to navigate around on a website will be more headache than it’s worth. We’ve come a loooong way since using arrow buttons and the Tab key to select what we want, and websites just won’t bend to the Kindle’s will. In terms of display, when it comes to book covers, black and white is okay. However, I don’t feel that web designs and layouts contrast well at all on the device. It just isn’t there yet. Then, of course, we can’t forget the ePUB issue. That presents a problem for people who get e-books from their library. If you get a Kindle you are bound to the AZW, MOBI, or PDF formats. Most of the time that means you’re bound to Amazon.com. I’ve been able to convert some books to MOBI. Sometimes publishers can provide you with a Kindle format for eARC copies, so ARC readers don’t fret there! The Kindle is great for me, but it depends on what you want to get out of it. I don’t mind the ePUB issue so much because my library doesn’t carry as many e-books for the series I’m interested in. I think I should get a commission from Kindle because I’ve convinced about 3 people so far (strangers and friends alike) who were on the fence to decide on the Kindle. 22 books since January for someone that used to read maybe 1 or 2 per year is proof enough that the Kindle does something right. I will say that as I read the latest novel for my favorite series on the Kindle, I did sort of miss having a large book in front of me as well as physically turning the pages. I also ordered the hardcover which came later. I wanted to compare the experience and I did enjoy having two large pages in front of me, holding down one side of the book to keep the stray page from covering the other page (don’t you love when you’re in the middle of a book and both pages simply stay in place?!). It’s a different kind of immersion for sure. I’ve come to the conclusion that I can start new series with the Kindle just fine, but for older series I will probably need to purchase the paper copies until their end so that it feels just right. The scarcity of book stores does sadden me a bit. There are three Borders stores near me (two near my home and one near my job) and they are all closing down. The next closest bookstore would be a Barnes and Noble that’s sort of out of the way, so it looks like I’ll be ordering graphic novels, reference texts and the like online from now on. Once the Kindle gets a handle on e-ink that’s capable of vivid colors and no glare, they’ll probably maintain their status as the leading e-reader for a long long time. Hello, fellow Paranormal and Urban Fantasy fans! I figure I will share a little history about myself. For the past 6 years I’ve been an avid fan of The Hollows series by Kim Harrison. Aside from catching up on all of the Anita Blake series, I didn’t really follow much else. All of that changed this past January when I purchased a Kindle. So far I have read 22 new books. If it’s good enough, I will devour it. Needless to say, my love for reading has been renewed and I’m excited to have a broadened my horizons a bit. Based on this blog’s title, it’s pretty easy to tell that I like vampires. Since branching out to other series, I can safely say you won’t see reviews for only vampire series. I love other series, but after a while I do feel the need to read a good ‘ole vampire story. And no, I did not discover how great vampires were until Twilight (though I don’t consider them as actual vampires; you need fangs, sorry!). With that said, I’ve been a fan long before this craze and will be a fan long after it fades. 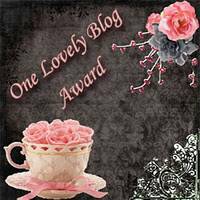 The plan for me will be to post all of my reviews–past and present–for related series I have read. You can expect a majority of them to center on adult Urban Fantasy and Paranormal series more so than the Young Adult genre; however, I did read quite a few Young Adult series as a teen, so I may include those in my blog for nostalgia. I may also review other genre and media including tv series, movies, manga, and games. I may even review products on occasion. While I have not read the works of the latter two, by the time of the con that won’t be the case. Here’s hoping they won’t mind my crazy costumes! I hope to provide any coverage I can for those of you who cannot make it, and maybe even meet up with those of you who will be there! Decisions, decisions, what should be my first blog topic? Of course, the Kindle! Stay tuned!